The Currywurst is quite a traditional Berlin fast food dish. It has been around since 1949 and currently over a million sausages are sold and eaten per week in Berlin only. It basically consists of a steamed and then fried pork sausage which is then cut into slices – and then covered with a special, often a bit spicy sauce. It is served virtually everywhere across the city and at any time of the day. And although other fast food dishes like Pizza, Halumi, Sushi, Thai Food and of course Döner Kebab are very popular too, according to studies the Currywurst still is the most popular fast food dish served in Berlin. But how did it become so popular? What’s the fuzz about this Wurst snack? Even though the Wurst (sausage) appears to be the main part of the dish, the sauce is actually what makes the Wurst a real Currywurst. Many Currywurst booths have their own ‘home made’ sauce formula which is often a well kept secret. Some of these booths have been in operation for decades – their sauce receipts have been passed on from generation to generation. The differences between the different sauces are however not that obvious. The sauce is mostly tomato based. It basically consists of ketchup or curry ketchup or tomato paste and is then enriched with a combination of various herbs. The dish is then topped with curry powder. But of course the combination of herbs is of course what makes each sauce unique. The Wurst is often served or actually ordered together with french fries or with a ‘dry’ bun. I personally prefer my Currywurst ‘blank’ – without any side dishes. But when I’m really hungry I prefer fries over bun. 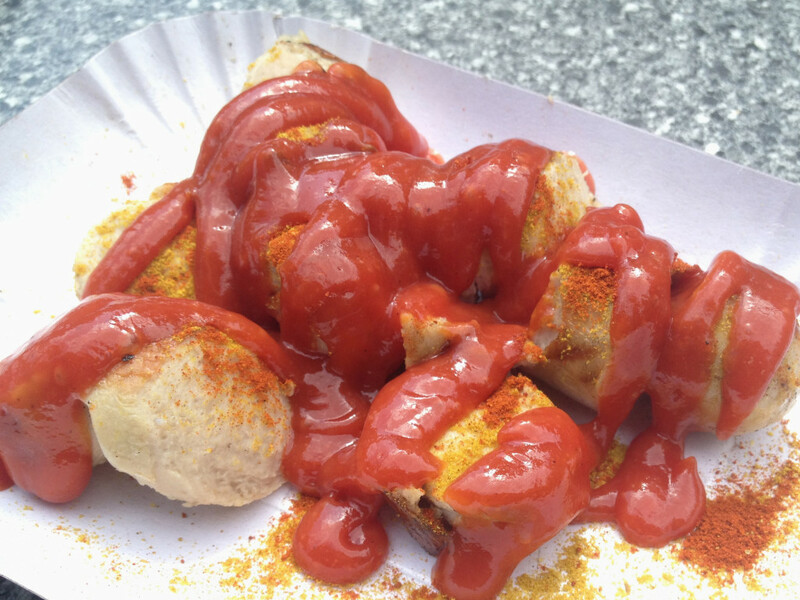 And also the Currywurst itself comes in two variations: with ‘skin’ or without ‘skin’ (Berlin slang “Pelle” – which is actually ‘natural (sausage) casing’ in English). The Wurst is fried in a ‘pan’ filled with frying grease (Fettwanne). It is then cut into slices, often it is still hand cut – the heavy frequented locations have a special cutting device that cuts the Currywurst into pieces. Currywurst is basically served all day long – every day. The German Currywurst Museum near Checkpoint Charley estimates that in Berlin alone about 70 million ‘units’ are sold every year. You may see construction workers eating Currywurst in the morning, sharing a table with party people grabbing a snack on their home. Most people will however probably have their ‘Curry’ around lunch time, I suppose. So do I. It is said that the Currywurst is actually a Berlin invention. The story goes like this: After the Second World War allied forces were stationed In Berlin – and with them new food and hard to get ingredients were introduced to the Berliners. In 1949 Herta Heuwer purchased ketchup (or probably actually Worcestershire sauce) and curry powder from British troops and combined those ingredients to her own special sauce recipe. At that time Herta Heuwer ran a small fast food booth (or actually a street stand) in West Berlin’s borough Charlottenburg, at Kantstrasse 101. People enjoyed the delicious dish a lot and soon it spread all across the city. In 2003 a plaque was mounted on that building at Kantstrasse 101 to honor Herta Heuwer’s achievements. On her 100th birthday the German version of Google welcomed its visitors with a dedicated doodle which you can see here. Also in Hamburg and in the so called Ruhrgebiet (Ruhr district, near rivers Ruhr and Rhein, the largest urban agglomeration in Germany including the cities of Duisburg, Oberhausen, Bottrop, Essen, Gelsenkirchen, Bochum, Herne, Dortmund etc.) the Currywurst is a very popular snack. Hamburg even claims to have invented the Currywurst – probably only to mock Berlin about its ‘great achievement’. And another ‘hotspot’ for German Currywurst is Wolfsburg, where German car manufacturer Volkswagen has its headquarters. VW alone produces some 6.5 Million Currywurst units per year – the company’s most popular single product.